While our daily lives are clearly affected by the “flashier” parts of the water cycle (rain, snow, etc. ), other parts of the cycle — such as the groundwater moving beneath our feet — are just as important. We use groundwater for irrigation and drinking water, and it affects natural processes and habitats. When studying groundwater, it’s often important to understand the movement of various solutes through the water. To predict solute transport, scientists can use multiphysics simulation. If you could look below the earth’s surface, what would you see? You would find a great amount of fresh water, as around 30% of the total fresh water on Earth is located under the surface. 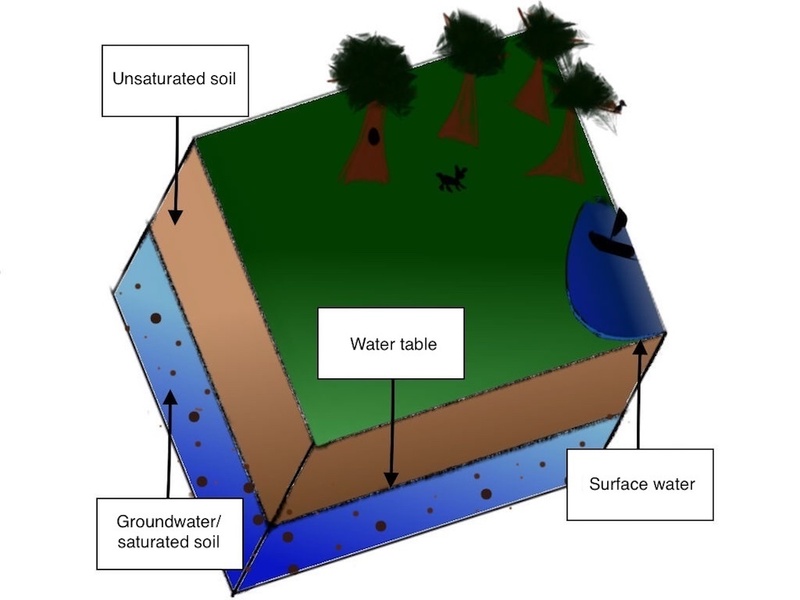 Groundwater doesn’t flow like an underground river, but instead acts like water in a sponge, filling up the spaces between soil and rock particles. Ensuring that groundwater remains unpolluted is critical. Not only do we rely on this water for drinking and irrigation, but it also affects the health of different habitats and contributes to the flow of rivers and streams. Engineers work to prevent groundwater pollution (which can harm both humans and wildlife) and routinely monitor groundwater movement and health. 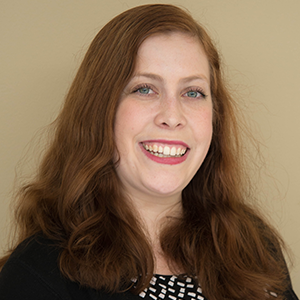 These efforts involve detecting pollutants in groundwater and using devices like artificial tracers to investigate groundwater flow and movement. 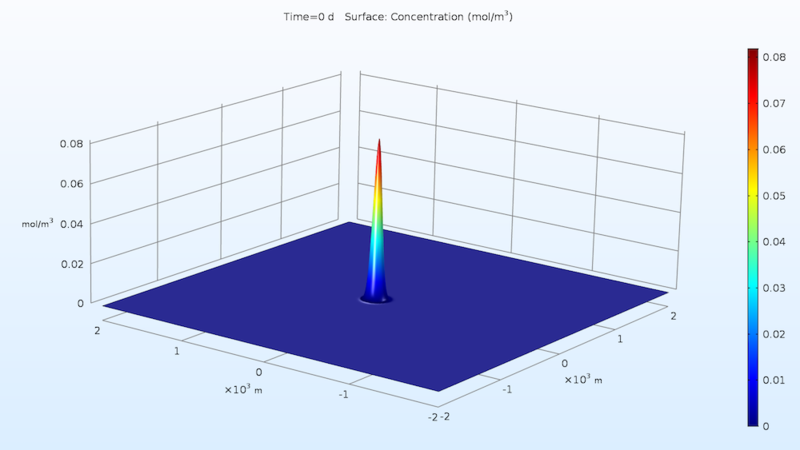 To accurately predict the transport of solutes like pollutants and tracers within subsurface fluids, environmental and geoscience engineers can use the COMSOL Multiphysics® software and the add-on Subsurface Flow Module. With these tools, engineers can help prevent pollution and enhance the design of groundwater tracers. In this example, we track a solute within a prescribed groundwater flow that takes longitudinal and transversal dispersivity into account. The solute moves through a 16-square-km area over a time period of 1000 days. This particular setup often serves as a benchmark for verifying different methods of simulating species transport. Here, we use a benchmark situation published by Zimmermann et al. in 2001. Using the Transport of Diluted Species interface, we solve for the initial concentration of the model, which follows a Gaussian distribution. The model geometry consists of a square with sides that are 4 km long. The initial concentration follows a Gaussian distribution, shown here. To confirm the accuracy of this model, we compare it to an analytical solution from Wilson and Miller (Ref. 1 in the tutorial documentation). To do so, their analytical solution is defined as a function in COMSOL Multiphysics. Since the resulting expression is long and only used for comparison, we simply load a preset file that already contains the analytical solution. 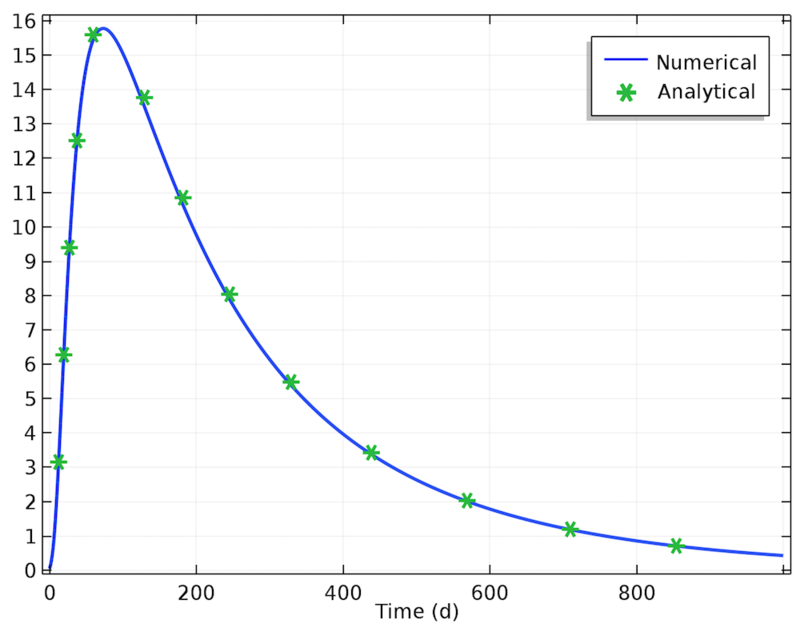 The analytical solution, showing the concentration after 1000 days have passed. To compare the simulation results to analytical results, we generate a plot depicting the concentration distribution after 1000 days. 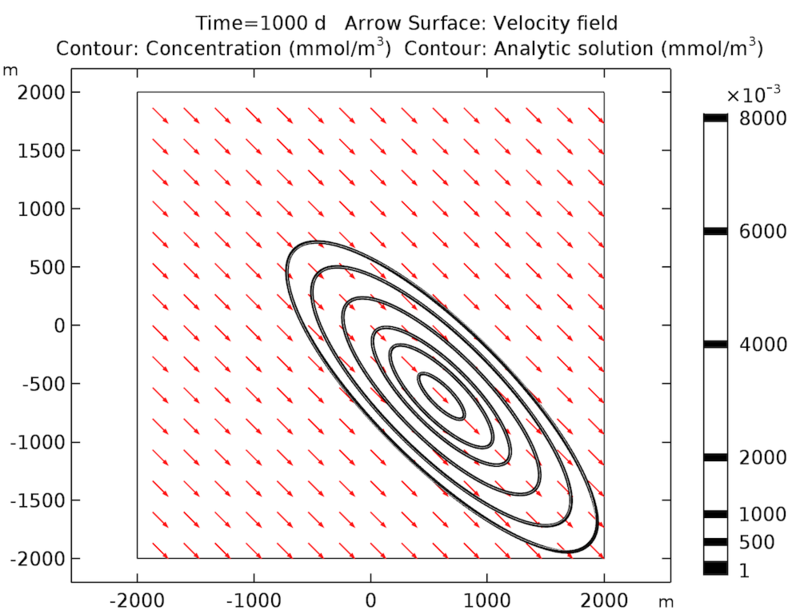 This plot, depicted below, shows that the simulation results (black contour lines) match the analytical solution (white contour lines within the black contour lines). Concentration distribution after 1000 days. The prescribed flow direction is indicated by the red arrows. When we compare the simulation and analytical results in a solute transport breakthrough plot, we see that the results match here as well. This agreement further verifies the accuracy of the subsurface transport simulation. 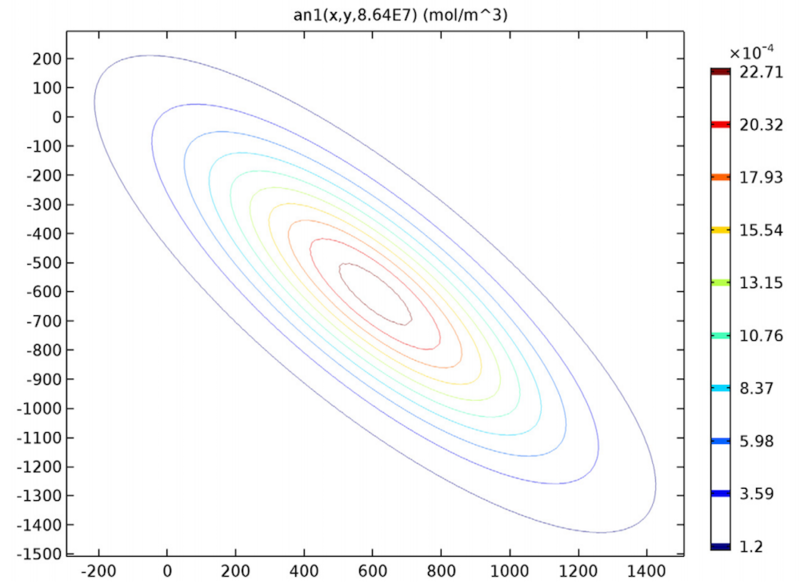 Solute transport breakthrough plot comparing numerical and analytical results.